Shanty Elena van de Sande: Hi Paul, please explain what PSD2 and Open Banking are – and how they are connected? Paul Rohan: Open Banking is an emerging concept and business model in financial services. There is a “market forces” definition of Open Banking. It refers to the use of Open APIs that enable third party developers to build applications and services around banks that act as a platform. There is also a “regulatory” definition of Open Banking, focused on greater transparency and choices for bank account holders that is being enforced by regulators. The regulatory definition is very much of European origin. The EU has identified Open Banking as one potential remedy to an area of slow innovation and market development that seems to be holding back the competitiveness of its trading bloc. European regulators intervened in late 2015 and adopted a second Payment Services Directive (“PSD2”) that compels banks to connect their digital assets to entities outside their organizations through a standard API interface. Elements of the new EU law become active in EU Member States in January 2018 and mandatory industry standards for the banks’ API will be in place in early 2019. Q: Why should card specialist businesses outside the EU track the evolution of Open Banking? Paul: One intention of PSD2 is to create a new distinct species for retail digital payments in the EU. Shared by traditional banks and regulated third party payment initiators, there will be a customer-triggered Credit Transfer for transferring funds from a customer’s account to that of the Merchant providing the goods or services. This is a radical intervention in market structures because the new law forces that banks charge the same, whether the payment instruction comes through the bank’s own-brand channel or through a third-party payment initiation service. Q: Why would Merchants find this business model an attractive alternative to card payments? Paul: By relying on bank security, this method of payment is hard for fraudsters to replay elsewhere. Retailers will not handle the digital credentials of customers in the form of card details, so they will not have to comply with a PCI security standard that could bankrupt their businesses with fines and penalties. The speed of ACH payments is moving towards “immediate” across the world, which merchants will value. There is also an irrevocable payment to the merchant. Unlike a credit card, the method does not offer any repudiation mechanism and does not facilitate reversals or refunds. There is a simplicity and predictability to ACH pricing, in contrast to an array of fixed, variable, tiered and once-off card charges. Q: Why would Merchants be wary of this payment type compared to cards? Paul: If the customer pattern moves towards bank-to-bank credit transfers rather than cards, Merchants will want to see the same share of sales being funded by unsecured consumer credit. Overdrafts on bank accounts are not a pure substitute for the type of structured credit agreements customers are used to with card limits, minimum monthly payments and interest-free periods. Card payments are supported by schemes with great brands that are recognized globally and entice consumers from all locations. Merchants will value the 50 years of brand equity and customer acceptance in card payments. Q: How likely is this new model to spread to the US? Paul: I think that card specialist companies in the US need to look past the idea that US regulators might copy the EU’s intervention. While there are entities that will lobby for mandatory Open APIs in US banks, let’s assume that the headwinds from the White House against perceived excessive regulation rules out any US intervention. It is possible that free market forces cause Open Banking models emerging in the EU to become de facto industry standards in the US. In a totally free US market scenario, there is evidence of customer demand for Open Banking. Online Banking services are being methodically screen-scraped by non-bank services on the customer’s behalf to help provide account information services. This willingness to allow screen-scraping, despite obvious concerns about the security risks involved, can be considered to be passive-aggressive customer-led demand for Open Banking. Q: Do you see particular US initiatives in response to this new European model? Paul: Some US banks are entering into bilateral partnerships with partners to replace screen-scraping with partner APIs. To offer account information services through a partner using APIs, a US bank has to design and implement new processes covering the sharing of authentication procedures, encrypted communication sessions, session management, secure data storage by the partner, client consent management and partner contract management. The extension of a partnership from account information to include payment initiation services for ACH payments can be regarded as a relatively smaller step. Q: Can you give another example of a scenario in which the US bank benefits from the PSD2 model? Paul: There is a use case for US banks to consider an alternative to card scheme payments. Card transactions rely on the card scheme provider’s technology to handle the transaction execution and banks have no role at that precise stage of the process. With PSD2-type services, it will be a bank’s own infrastructure executing the payment. The customer will be using the bank’s service directly in real time to authenticate themselves and authorize the payment. The bank’s involvement at this stage presents an opportunity for the bank to tie together the customer’s financial position and immediate purchasing behavior. The market position of a bank will be less threatened by the Acquirers, Acquiring Processors and POS/Gateway providers who gather data along the cards value chain. However, a use case is not a business case. Q: Will Open Banking receive the same regulatory push in the US? Paul: Since 1958, the US has been the home of the credit card. Its market position has been unrivaled. Disruptive business models tend to travel from the US towards the EU and the not the other way around. We can assume that Open Banking will not receive the same regulatory push in the US. Nevertheless, the PSD2 model in the EU could take root and set a global benchmark. EU banks and vendors could start to regard the US as a growth opportunity. The opening of bank APIs on a competitive basis in the US, albeit for partners and perhaps only for account information-type services, will start to lay the physical foundations. For the first time since 1958, card payments could have a credible rival at point-of-sale, which will put pressure on margins to be shared across all participants in the cards value chain. Q: How can US-based payment and risk professionals track these developments in Europe? Paul Rohan’s blog posts on PSD2 and Open Banking are followed by thousands of market professionals through his LinkedIn profile. Paul is also the author of “PSD 2 in Plain English”, available on Amazon in both paperback and eBook. 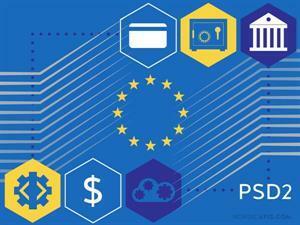 It is a succinct primer text on PSD2 that was awarded a “Plain English Book Mark” for clarity.